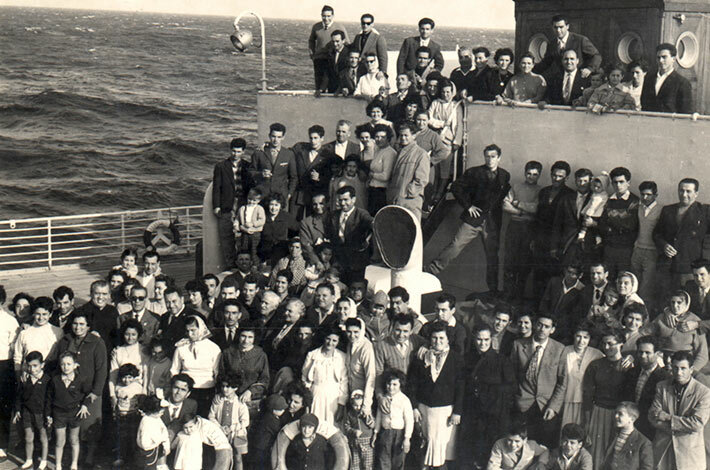 Black and white group photograph of immigrants posing for a photograph aboard the passenger ship Italia. Donato Sforza emigrated from Italy with his family in 1959 and are part of the group in this photograph. According to the archives at Pier 21 in Halifax, Nova Scotia the Italia stopped at the following ports: New York, Montreal, Quebec, Halifax-Plymouth, Havre, Southampton, Zeebrugge, Cuxhaven and Hamburg.